This week saw the death of one Nobel literary award winner and the commemoration of another. Neither attracted anything like the media coverage as the death of Sue Townshend, author of the Adrian Mole series. I’m not decrying Townshend’s popularity or her achievements, just baffled at what kind of news judgement is being exercised among members of the Fifth Estate. St Martin-in-the-Fields church in central London was the venue for a celebration on Monday of the life and work of Doris Lessing who died in November 2013 at the age of 93. 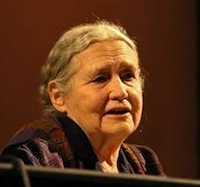 One of the speakers, the biographer and critic Hermione Lee remarked on how Lessing had throughout her work asked “ruthless questions about the way we live now”. As a young woman she rejected the brutal, racist colonial system into which she was born becoming a vociferous and life-long campaigner against apartheid and discrimination and having embraced Communism she came to question its teachings and indeed all other other codified political systems. The event passed almost unmarked by the mainstream media however – only the Daily Telegraph seems to have shown an interest with this personal reflection by Gaby Wood. On Thursday, the death was announced of a writer considered to be one of the greatest writers to emerge from Latin America, Gabriel García Márquez. Few other writers did as much to change the course of a region’s literature but that’s what Márquez did with the publication of One Hundred Years of Solitude in 1967. 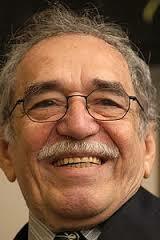 It marked the beginning of a long association between the genre of magical realism and Latin American authors. Most of the leading publications have run obituaries and tributes in the last few days but one of the most interesting pieces I’ve come across was a 1981 interview with the great man in Paris Review in which he talked about the differences between his work as a journalist and as fiction writer and the many authors and books that influenced him in his younger days. He was almost knocked off his bed when he read the opening line of Kafka’s Metamorphosis he said, not realising until that point that it was permissible to write in that fashion. Check out the Paris Review article if you can. Should celebs write children’s fiction? Madonna’s done it. So have Jamie Lee Curtis, Jerry Seinfeld, Sarah Ferguson (the former Duchess of York); Katie Price; Paul McCartney and Sting. Some of the ventures by these celebs into the world of children’s fiction have been rather more successful than others. But what makes a singer or actress pick up a pen and begin writing (other than the very obvious reason that they want to keep their name in the public domain and they can trade on their celeb status to earn even more money). More to the point, should they? That’s a question tackled in a debate between Tom Lamont, the Observer newspaper’s commissioning editor and author Robert Muchamore. …while a celebrity name might sway a few parents into buying a picture book, the kids who read them not only don’t know who the celebrity is, but usually don’t even understand what an author is. Lamont’s point is along the lines that the celebs think writing a children’s book is easy, an attitude which is disrespectful to the skills of ‘real’ children’s authors and also to the child readers. I couldn’t agree more — just because we were all children once doesn’t automatically give us the skills to write for them or to understand that what interested us as children will interest young people of today. There’s an art in finding the right voice and language so that you neither patronise nor confuse, and an art in deciding what would or wouldn’t interest children. Oh and then there’s the whole complicated issue of what topics are ‘appropriate’ for children. Melvin Burgess and Jacqueline Wilson have shown that children’s fiction can tackle emotive subjects like adoption, drugs, divorce but they do so with a huge amount of sensitivity honed over many years of experience. The one point I was surprised not to see discussed was the issue of funding. If publishers pay large advances to politicians and stage/screen stars who want to dabble in the children’s fiction field, doesn’t that mean less funding is available to support full-time writers?